One Step Forward in the Euro Zone? It would have been hard to believe only a few weeks ago that the euro zone could be the source of any good news let alone news to help push the market forward. Yet, with last week’s successful bond auctions and the pledge of international superpowers such as Japan and China to buy Euro zone debt and the ECB’s sudden more hawkish tones, the obvious question is; are we out the woods yet? Hardly, but it was interesting to observe the almost coy manner in which the ECB slowly but surely began the move towards contemplating to think about raising interest rates. We are not there yet of course, and I still think that any hike in the ECB’s refi rate are, for now, confined Weber’s dreams and a very distant playbook sitting around somewhere on the lower levels in the Frankfurt tower. But let us be honest, stranger things have happened than the ECB raising rates just before the next downturn. Indeed, you might even call this a leading indicator. He [commissioner Oli Rehn] indicated that various options would be discussed among European policymakers but that it was too early to comment on this in more detail. However, Rehn mentioned that one modification could be related to the rate charged on EFSF loans, with a view to reduce those. Other media reports suggest this could also include the provision of short-term credits to euro area member countries requesting support, the purchase of government bonds through the EFSF, or a change of collateral rules to boost the fundâ€™s effective lending ceiling. The system has reached the stage that a bankrupt sovereign state is issuing debt to buy bonds in a vehicle that is tasked with buying debt from a bankrupt Sovereign state that is no longer able to go to market. Folks this is reaching the level of a Monty Python skit. This brings up a serious question not seen answered in the public yet.Who is ultimately responsible for the bonds that the rescue fund is going to be selling as AAA investments? Whose AAA balance sheet is guarantying these bonds that will be sold to investors like Japan? So, apart from the obvious issue of issuing more debt to pay off the debt used to finance the debt of bankrupt sovereigns, there is a question of what exactly it is China and Japan will be buying. I am willing to give the EU some benefit of the doubt here especially since I have long been a strong advocate of issuing Euro bonds. But then, these are not Euro bonds as such, but rather instruments used to capitalise a fund which, as Jack Barnes succinctly notes, is in dire need of a capital injection even before it has deployed a single euro of capital. Obviously, the EFSF was created as an attempt to ring fence the problem in the periphery and thus to hedge against a future blow-up . But this always missed the point in the sense that we didn’t really need a bailout fund, but a rather a structural change in the way we perceive and organize the link between fiscal and monetary policy in the euro zone. As traders like to remind newcomers to the business, hedges are things you buy at a B&Q, not at your broker. The EFSF could conceivably bailout a large part of the inflicted economies, but then there was always going to be Spain not to speak of Italy which it cannot deal with. On that note, it was eye-wateringly embarrassing to hear both the Spanish finance minister and the Portguese prime minister daftly using their respective “successful” bond auctions to note that neither of the their respective economies were going to need any form of bailout simply because they don’t need it! This is then not to play down what was a long awaited successful event in the context of the European debt crisis which I unilaterally applaud (and hope for more to come) it is merely my attempt to put things a little into perspective. In this light, the gradually more hawkish tone by the ECB could be be seen as a little bit of stick to show economies that while we are here to help, we are also here to do our job which is to protect the purchasing power of all the euro zone citizenry. This may of course be waffle, but the ECB has long had a legitimate problem with simply playing the game in the form of providing liquidity and and even buying up peripheral bonds while playing into inability and flatfootedness of euro zone policy makers. Naturally, my bet is that we have only seen the nascent moves of what will become a full fledged measure of QE by the ECB and much more aggressive buying of sovereign bonds (simply because they have to), but this does not mean that policy makers can simply ignore the facts as they are presented by economic data and common sense. But I might just be too harsh here and all it might be me who are behind the curve as those very same policy makers are now moving ahead of the curve in the form of, allegedly, a two-front attack on the situation with a bail-out of Portugal and a full euro zone backstop to whatever black hole the Spanish banking sector might turn out to be. Especially this last bit is interesting because it coincides with the news (albeit not fully confirmed and digested by the analysts) that Spain would stand ready to inject a hefty sum of money to shore up its banking system. Just as the European Central Bank announced that Spanish bank borrowing resumed its upward trajectory last month (â‚¬70bn in December, up from â‚¬64.5bn in November) El Confidencial is reporting that Spain is preparing a massive capital injection of between â‚¬30 and â‚¬80bn to clean up the cajas, or local savings banks. Having long been the twenty thousand pound elephant in the china shop this is indeed something worth noting more than in passing. Going into perma bear mode I am thinking about Ireland and the sudden reversal of a relatively good sovereign who was brought to its knees by its promise to see through the bailout of its financial sector. The point is that Spain is structurally similar with high private debt, and relatively low sovereign debt and while Ireland was probably going to hit the canvas in any case, its situation got worse by the ongoing quibble about what euro zone bailout funds could be used for. Specifically, the explicit refusal to allow the funds to bail out banks put the whole Irish situation in a tight spot although it was eventually an academic demarcation as the two got fused through the dreaded Irish government guarantee to backstop its largest banks. 1) This is only the cajas, there will then need to be more for the banks (somehow). In fact, once the political argument is settled, the thing is much easier in the cajas case, since because they can’t go to the market with shares, the only thing to do is semi nationalise them, and then refloat later. 2) This then will be the first de facto step of Spain into the arms of the EFSF, since obviously the Spanish sovereign won’t be able to fund the injection (at least not at viable interest rates). Spain should be in completely between May and August. As such, if it is part of a general euro zone backstop to the Spanish financial system it may be quite a move (and also as noted a sea change since all the quibble on Ireland concerning the use of bailouts would be presumably have been put in the past). I emphasize this since the clock is ticking and the same momumental structural challenges lie ahead even if one country’s successful bond auction may seem to have changed the situation for a while. As such it might be worth having a look at those fundamentals of the euro zone again and what the proposed (and inevitable) correction mechanism presents in terms of challenges. […] the forces which have lead to the build-up of imbalances are joined at the hip with the same forces which make it almost impossible to correct from within the Euro zone. Specifically the idea of a debt snowball effect is a good way to show why it will be almost impossible for some economies to correct their external imbalances without an explosive evolution in government debt and since they need to correct external competitiveness issues in order to achieve economic growth, the whole thing turns into a vice and essentially a catch 22. It is consequently, the rapid deterioration in the private and public debt dyanmics which euro zone policy makers and the IMF are so concerned with and thus trying hard to backstop and reverse. But it might not be so easy as to focus entirely austerity since debt dynamics are also driven by your ability to grow. At this point you may rightfully wonder then what the hell a debt snowball looks like? Well, why don’t I show you then (see this paper for the model). 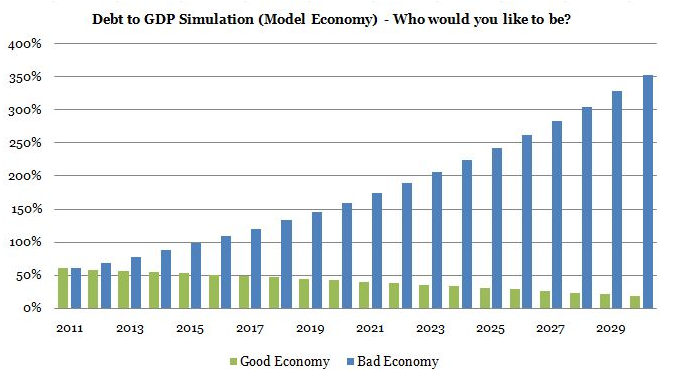 Now, in any economic model we need assumptions and instead of feeding in any of the forecasts for the periphery (which are hugely uncertain) let me take the point of view in a model economy with somewhat better fundamentals than many of the peripheral economies. As you shall see, the initial condition matters less than the underlying dynamics for creating a debt snowball. As such, I assume that my model economy starts with a debt/gdp at a humble 60% to GDP (say in 2010) and that it pays 5% on its entire sovereign debt portfolio. The point here is that while e.g Portugal might have paid 6.7% on its last issuance it does not pay this on its entire portfolio of liabilities. This is also why we have been talking so much as about roll over schedule since if you are so unfortunate that you need to roll over and refinance in times of trouble you are likely to incur a high cost that affects your entire liability side. Finally, I crucially assume that you can’t have both austerity and growth at the same time. If you want growth it will cost a higher fiscal deficit and if you to run down the fiscal deficit you must endure deflation (negative nominal GDP growth in essence) and it is this latter which the ECB and EU are pushing. Especially this last assumption is absolutely crucial to understand since it is this situation the periphery faces with an internal devaluation in the euro zone (click on all pictures for better viewing). The bar shows the average from the simulations shown by the line plots. As you can see the numbers are obviously fantasy numbers, but since this an average across many different scenarios where both the fiscal decifit (austerity measures) and growth are dynamic it might not be entirely irrelevant. The set up of these simulations are quite simple. I can change three things in my model; the growth rate, the interest rate, and the budget deficit (primary deficit) . 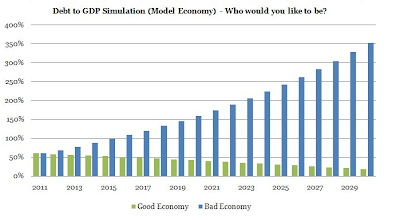 In all the simulations the interest rate is set at 5% and then I build a cross section where I dynamically change the growth rate and budget deficit building in the trade off that you cannot have a low budget deficit and “high growth” at the same time. Obviously, the results are quite sensitive with respect to how strong you believe the trade-off is between growth and fiscal austerity. I have built in a pretty strong trade off in order to demonstrate what I believe are signficantly worse short term growth dynamics than the consensus. This is also why the model’s result becomes exponential at longer time horizons. Suddenly, the numbers look more realistic but not less scary since you need to remember that this is the average evolution of public debt across all policy mixes (i.e. in a continuum from high growth negative and large budget deficit and low negative growth and fiscal surplus). It is exactly because correcting from within the euro zone imposes this trade off that you end up in a catch 22. Take the example that our model economy manages to realize a constant budget deficit of 6% of GDP which results in a zero growth rate of GDP. In that situation the model predicts a debt/gdp ratio of 160% in 2020 (98% in 2015). It goes without saying that if your initial level of debt is higher, the corresponding level of debt will be corrected up. I am not presenting this as truisms and prediction tools since evidently economic models are anything but. Instead, they should serve mainly as evidence that bailouts are going to be needed and also sadly that defaults of both the sovereign and private ones are coming and they will be costly. 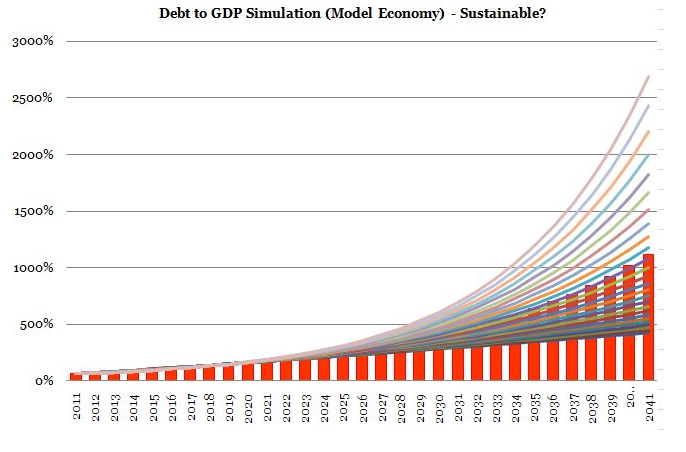 Finally and just for the sake of argument I thought that I would demonstrate that this model is not simply about exponentially increasing debt/gdp ratios. Consequently, the “good economy” and “bad economy” below both pay 5% on interest on their government bond portfolio but the former has a budget surplus of 3% a year and grows at a rate of 3% a year as well. The latter on the other hand looks more like the periphery with a budget deficit of 5% and a negative growth rate of 1%. Again, the point is not to extrapolate into the infinite unknown, but to observe that even in the very short run this creates unsustainable debt dynamicsfor the “bad economy”. – So I am being very nice here not even considering interest rate payments on existing debt. This entry was posted in A Fistful Of Euros, Economics and demography, Economics: Country briefings, Economics: Currencies by Claus Vistesen. Bookmark the permalink. 1. I see the ECB “threat” of a rate hike as a political move. Basically it simply isn’t the job of ECB to be the savior. That obligation resides squarely with Bruxelles, and ECB are sending the signal that the politicians need to get their act together, or the ECB will perhaps interpret their mandate in a very narrow fashion, thereby taking out Spain’s rather weak legs from underneath them (because of flexible mortgage rates). 2. Olli Rehn is taking an awful chance, when he opens up for lower rates from EFSF help. This is a central issue in deciding on the legality of EFSF in relation to the German constitution, and we are all awaiting their decision rather anxiously as it is. My own personal take on how the drama will unfold is fairly simple. I can’t see the politicians coming up with anything really useful, mainly because Germany’s hands are pretty much tied by their electorate and their Constitutional Court. If I am right in this assumption, then it follows that ECB will eventually be faced with a choice between ceasing to exist or to undertake massive QE. In that situation they will undoubtedly opt for QE. This in turn would make it illegal for Germany to remain a member of the Eurozone, so they will have to withdraw. I think Holland, Austria and Finland would join the exodus. I think you are largely right on the ECB but I would add that it is ultimately a noncredible threat. Obviously, no one believes that the ECB refi rate has anything to do with the funding conditions of the periphery, but I don’t think the ECB would risk sending the signal that inflation comes before anything else (even if this is its mandate). is really the gist of my piece. The kind of interest rates we are talking about at the moment (especially for those who need to refinance a lot) is simply not possible! So the question becomes, what yields will the AAA bonds from the EFSF come in at? And more importantly, what yield “level” would the market ascribe to a debt instrument issued with the COMMON backing of the entire euro zone? We don’t really know yet. As for Germany, you are the expert here i guess :). I am with Edward here in that it seems mad to me if Germany led an exodus party from the euro zone. The new DM would be drastically revalued and where would this take German exports? Basically, there is an underlying flaw in this argument which hinges on the idea that Germany will (should?) contribute to global rebalancing through strong consumption growth. With the current fall in risk premium for Spanish debt it apppear that the market’s worries about Spain are focused on the doubts that the Government is taking the threat to their banks seriously. More details here..
…if so, Spain might have a chance of avoiding a bail out.